Last week, the Maharashtra Anti-Terror Squad (ATS) busted an ISIS-linked Islamist terror group ‘Ummat E Mohammadiya’ planning mass casualty attacks by mixing poisonous chemical mixtures in water and food at public gatherings. 9 men, most in their early twenties and including one juvenile, were arrested – they are well-educated, internet savvy and working in white-collar jobs as software/mechanical/civil engineer, architect, medical representative etc. Some of them were from well-off families, with relatives working overseas. Chemical liquids and powders were seized from them, and they were conducting experiments to fine-tune their plans in Aurangabad and Thane, ATS officials said. The arrested men include 3 brothers – main conspirator Mohsin Sirajuddin Khan (32), Salman Sirajuddin Khan (28), Taqui Sirajuddin Khan (20), and 6 others – Mohammad Mushahid Ul Islam (23), Mohammad Sarfaraz Ahmed (23), Mazhar Abdul Rashid Sheikh (21), Jamman Kuttepad (32), Fahad Ansari (25), and a 17-year-old youth who is a student of Class 11 (Science). Mazhar Sheikh’s father is a sharp-shooter of the Dawood Ibrahim gang. 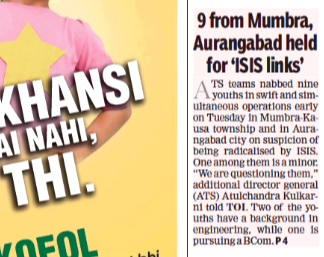 ATS had put the suspects under surveillance for several weeks and swooped in to arrest them from five different locations in Mumbra, Thane and Aurangabad when it was revealed that the group is close to carrying out terror acts. On Saturday, the ATS arrested yet another youth from Mumbra, a management graduate identified as Talha alias Abubakar Potrekar (24). Potrekar was in touch with an ISIS handler in Syria from 2014. He has allegedly radicalised at least 12 people from Khed, Pune, Aurangabad, Nanded and Beed in the last four years. His arrest will lead to a bigger crackdown on active ISIS handlers across Maharashtra, sources said. ATS officials said Talha appeared to be the ‘HR manager’ of the group – a trained scuba diver, he would ‘orient’ new recruits and encouraged them to start physical training to get fit for the forthcoming ‘war’. “He is smart and very sharp. He used his management skills to make the functioning of the group flawless. He is from a well-off family,” said an ATS source about Talha. The accused have been booked under relevant provisions of the Unlawful Activities (Prevention) Act (UAPA), Indian Penal Code’s Section 120 (B) (criminal conspiracy) and the Bombay Police Act. There are reports that those arrested in Thane had links with the Popular Front of India, a fundamentalist Islamist group based in Kerala-Karnataka which has also formed a political party called SDPI. News of such a terrorist group planning mass murder through chemical weapons would, in the normal scheme of things, send a shiver down the collective spine of society and invite intense media attention and scrutiny. The phenomenon of ‘truck jihad’ in Europe has shown how the Islamic terror threat is constantly evolving and finding new ways to inflict pain & suffering. But then, things are far from normal in India. Radical left-liberals have such a chokehold over our country’s narrative, especially the English-speaking elites, that even direct evidence of the ever increasing danger of Islamic radicalization is overlooked, all in the name of a distorted idea of secularism & due to fear of somehow assisting the ‘Hindutva agenda’. Here is how the 23rd January Mumbai edition of the largest-selling English daily in the country, Times of India (TOI) reported the news of this terror cell being busted. A minuscule column on their front page, squished in among the mega ads which are splashed all over the first few pages of this tabloid masquerading as a mainstream newspaper. 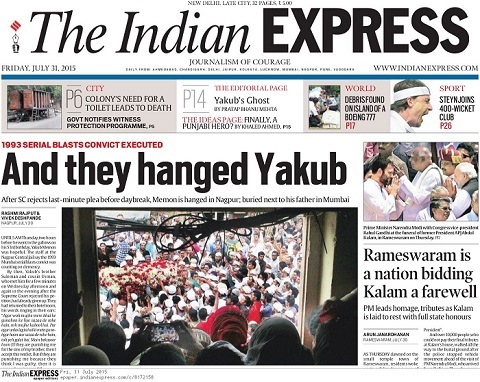 There are no follow-ups by TOI on its front pages on subsequent days regarding this important story. On 28th, another small column appears on page 2 of the Mumbai edition after Abubakr Potrekar’s arrest. Going by TOI reporting, one could easily be misled into thinking that these men have been arrested for supporting the terror group ISIS’ ideology, for ‘terror links/leaning’, but not for any actual plan to commit terror. After all, its not like the attack actually took place, right? Don’t be surprised if in the coming days and weeks, the coverage becomes more sympathetic towards the families of those arrested and what they are having to endure. The political ideologues posing as analysts/commentators who control the op-ed pages of our leading newspapers will either completely ignore the series of Islamist terror modules busted by NIA and other law-enforcement agencies during the last few years, or try to rationalize the frightening pace of radicalization among Muslim youth by talking about their alleged alienation and triggers like Babri, 2002 riots etc. What they will not tell you is that this modern phenomenon of ISIS-inspired jihad is not a backlash for any perceived local grievance (not that there can be any justification for terror), but driven by Islamo-fascist dreams of establishing a global caliphate encompassing historical ‘Muslim lands’ like Spain, Bharat etc. The modern day jihadi is not just some illiterate guy living on the Af-pak border, or a poverty-stricken desperado who has been brainwashed in some extremist madrassa, but the bigger danger today comes from the new breed of Islamist who is smart, educated, tech-savvy and yet thoroughly radicalized, to the point of considering a suicide attack as shahadat (martyrdom), a short-cut to heaven. But if you speak these bare truths, you will immediately be labeled a fascist right-winger, a Modi bhakt out to demonize all Muslim. Such is the desperation in Lutyens to see the back of Modi that not one of our establishment intellectuals has given credit to the NDA Government for drastically improving internal security compared to the UPA era when ISI-backed home-grown jihadis like Indian Mujahedeen were running amok carrying out serial blasts in every major city. We are a country where to settle political scores an ex-Home Minister rode roughshod over IB, his own internal intelligence agency, to declare that Ishrat Jehan was not a terrorist; where it was said without batting an eyelid that even if Ishrat Jehan was part of a terror cell, she was only planning some ‘chota mota‘ (small time) blast. Leading politicians of our country claim to have shed tears over the Batla House encounter, terming it ‘fake‘ despite all facts to the contrary like the death of a police officer in the very same encounter. In short, we are a country where denial or apologia for Islamic terror is a fundamental requirement of ‘secular’ votebank politics. We are also a country where the mainstream media wails ‘And They Hanged Yakub’ after a convicted mass-murdering terrorist is hanged after exhausting all possible appeals, including a rare midnight-hearing in Supreme Court obtained by his powerful lawyers. So maybe, we, the ordinary citizens (the much-despised ‘THEY’ for our media elites & Lutyens’ establishment), should not be surprised at the way this chemical attack plotting terror module, or another ISIS-inspired terror group ‘Harkat ul Harb e Islam’ which had amassed bomb-making material and even designed a rudimentary rocket launcher before it was busted by NIA last month, are being watered down or relegated to the back pages by our media. For now, we should be grateful that at least the present Government and security agencies are quietly and efficiently doing their job on the internal security front, keeping us safe. We should be grateful that the ‘leader’ who had blithely claimed “it is impossible to stop all terror attacks….we have stopped 99% of attacks” after yet another round of serial blasts ripped through Mumbai in July, 2011 is presently out of power and will hopefully remain so after the 2019 general elections if we the ordinary voters maintain our common-sense and ignore the uncommon advice handed down by our elites.